She has been charged to the magistrate court over the incident. 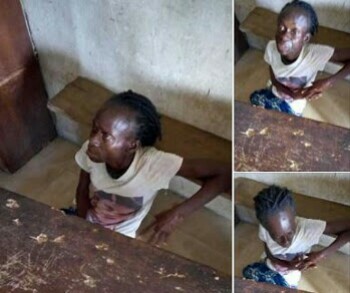 A Nigerian lawyer who reported the matter on his Facebook wall said: "This Woman is a witch, she got stucked and landed at the backyard of a woman police officer in the police barrack Sapele. She is in court this morning for arraignment. "At the time of filing this information she is already in magistrate court 1 Sapele waiting to be arraigned. "She confessed to the witchcraft act that she was (flying) to Amukpe Sapele to kill one of her brother called Fregene, that her fuel finished suddenly and that landed her on woman police officer yard in police barrack Sapele. "After arraignment she will be taken to the appropriate place to purge her of her witchcraft power." "Happening Now: This woman fell from the sky this morning in Sapele Police Barrack to the surprise of everybody. I saw her live."